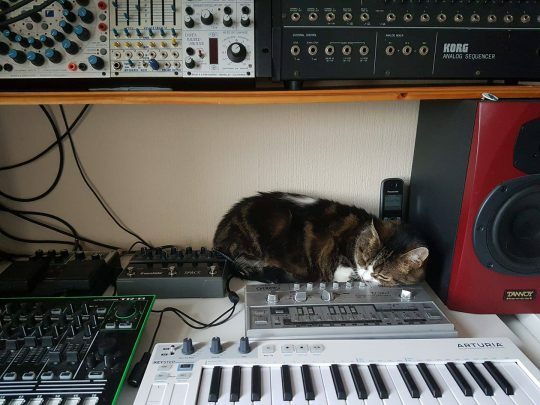 Martika found a nice spot behind the modular synth and control panel. 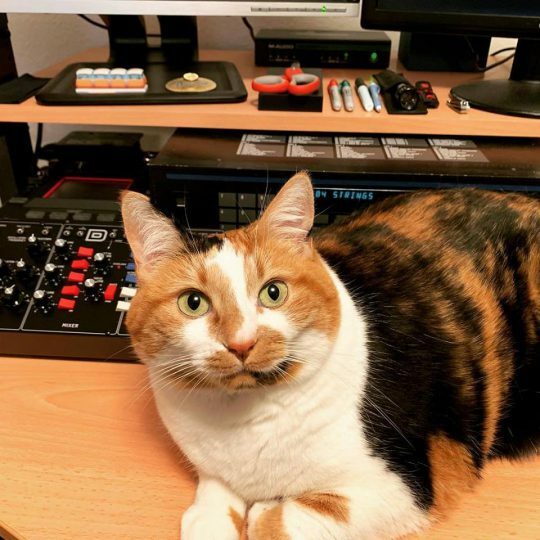 We also espy a Korg Kaoss pad nearby. From Mark Harrop via our Facebook page. 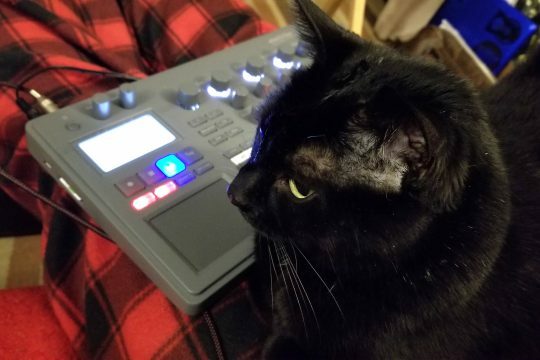 Murder (we’re sure there must be an interesting story behind her name) gets ready to perform on a Korg EMX2 Groovebox. From Jackies Fridge via our Facebook page. 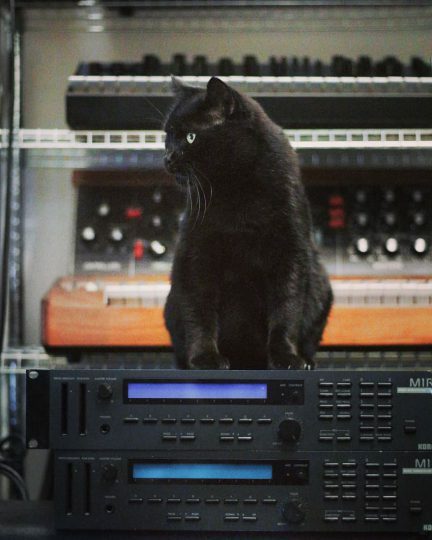 Part of a series of posts on our page this week celebrating black cats. From polynominaldotcom on YouTube, via matrixsynth. Just modded and bent the classic M1/M1r wavetable with 6 switches on the back of the machine. 5 sounds demo with circuit bent options. First 3 demo with normal Midi keyboard, In 2 others, the Mi1r is driven by an algorithmic generator module ‘Turing machine’. Generated patterns are midi converted with a Doepfer a-162 cv to MIDI module. 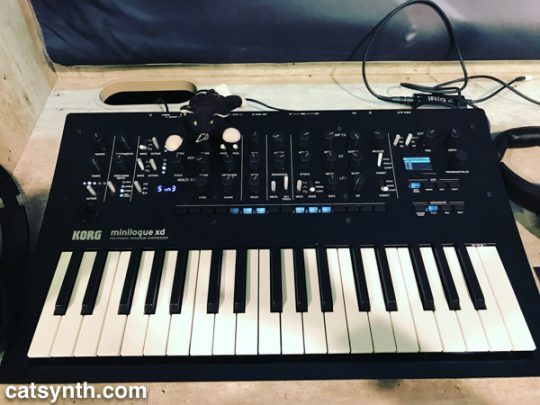 Very interesting to see a Korg M1 and M1R “bent” this way. And if that feline portrait looks familiar, it’s probably because you’ve seen it before. 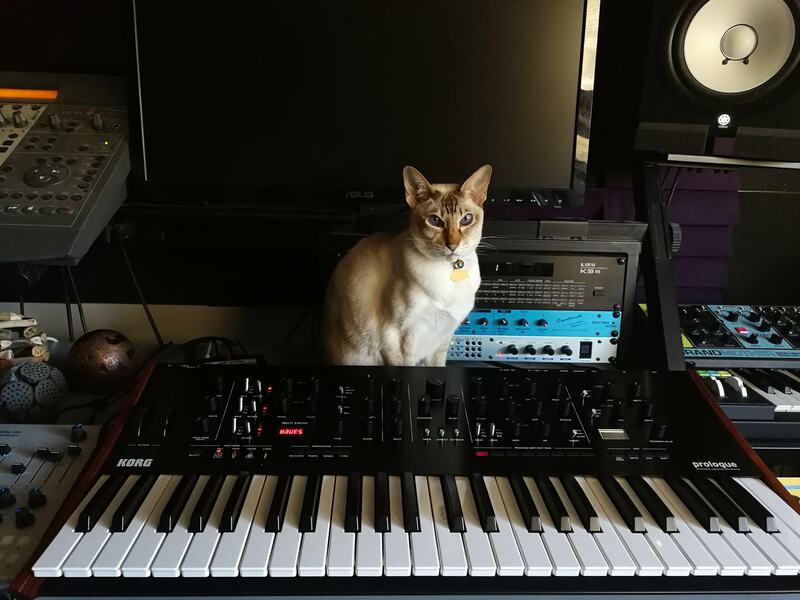 Eric of Polynominal.com and his cat Marcel are good friends of ours at CatSynth, and we have featured many of Marcel’s pictures. 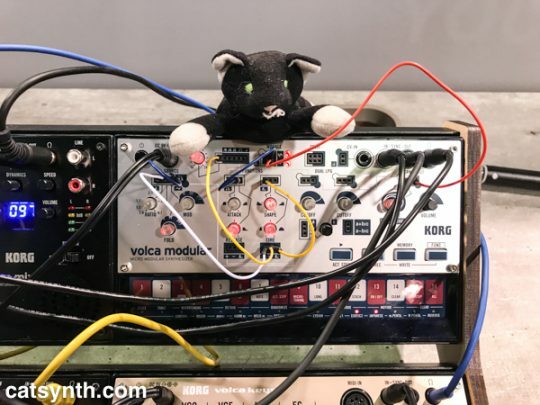 Marcel is back today, with a pair of Korg M1R modules. 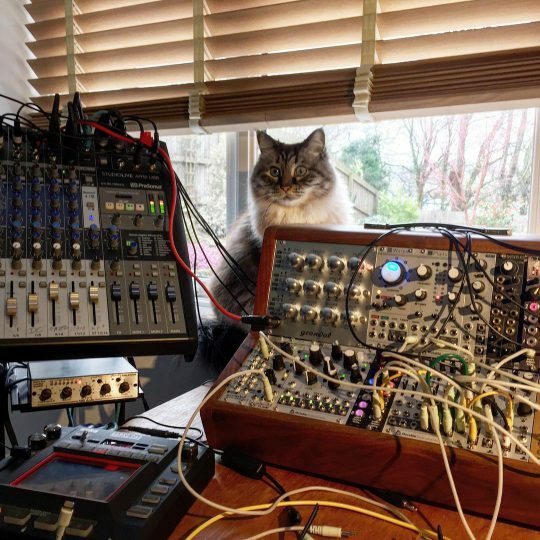 We also see a Minimoog in the back. Beautiful Persephone posing in the studio of our friend Rob Robinson. 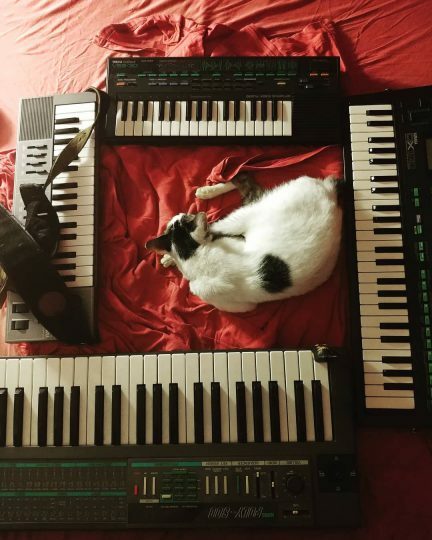 We see a Behringer Model D (aka “the Boog”), a Korg Mini Kaoss Pad (original edition), and a vintage synth module that we can’t identify behind the kitty. 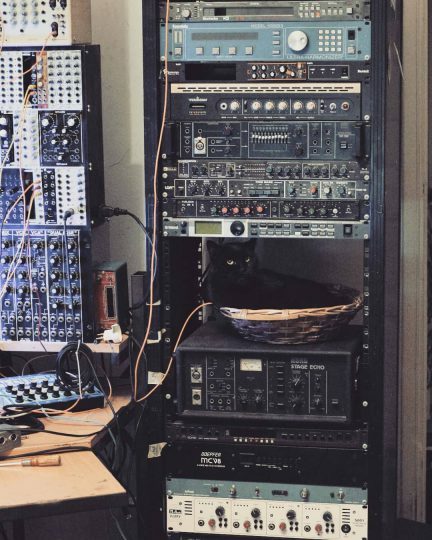 A lot of amazing gear in this one picture. We leave it as an exercise to our readers to identify (but there are some hints in the tags).